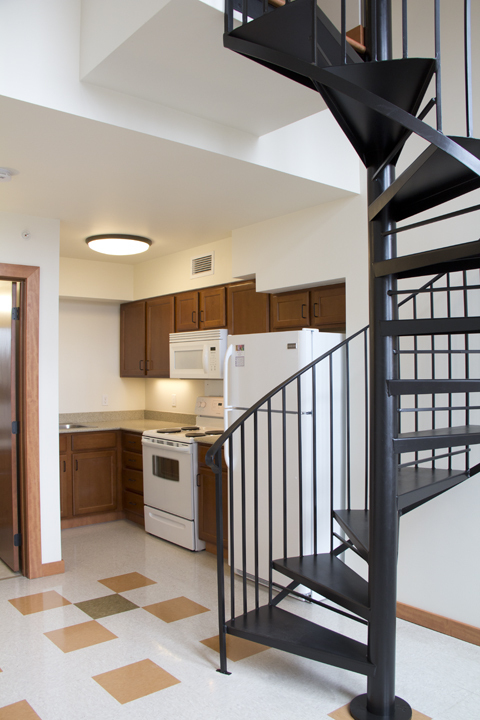 The Spokane Housing Authority's 51-unit Agnes Kehoe Place offers unique floor plans. More than 900 men, women and children are homeless on any given night in Spokane County. 2,200 Spokane County school children were identified as homeless during the 2015-2016 school year. 28% of our county's single heads of households have annual incomes under $15,000 and cannot afford the average one-bedroom rent of $596. A person living in Spokane County has to earn an hourly wage of $14.87 to afford to pay the rent and utilities for a modest two-bedroom home. National Low Income Housing Coalition Out of Reach Report 2015. Our local housing affordability is challenged by low household incomes and low vacancy rates among affordable rentals. A home is considered affordable if its occupants are paying no more than 30 percent of their monthly income for rent and utilities. The 2013 Real Estate Report, published by the Spokane County - Kootenai County Real Estate Research Committee, reveals that the rent amount for an average two-bedroom unit in Spokane County is $714. A Spokane County household must make over $31,000 annually to afford that rent. According to the 2012 American Community Survey, more than 24% of the households in Spokane County make less than $25,000 annually. The demand for affordable housing is high. According to the January 2016 SLIHC Semi-Annual Rental Survey, the vacancy rate among 3,454 affordable housing rentals owned by SLIHC members was 2.3%. Click here for reports about Affordable Housing in Spokane.